Talk about being in love, this is a concoction to make your heart pitter patter. Now, I love granola. I mean who doesn’t? It’s crunchy and sweet and perfect for snacking on. 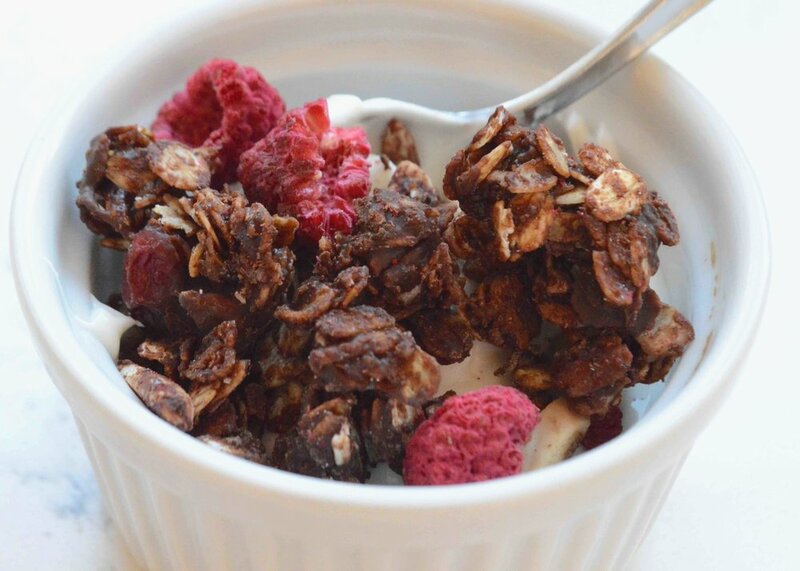 But guys, this is CHOCOLATE granola!!! Actually, double chocolate when I think about it. 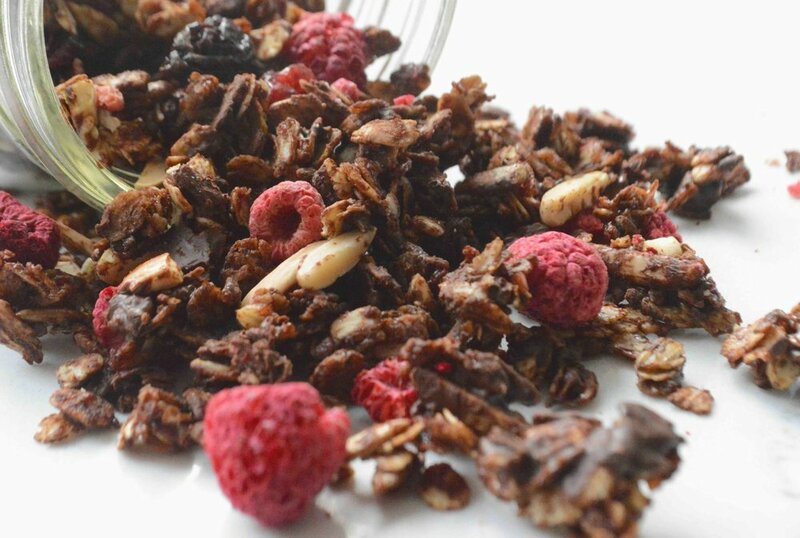 That’s because there is cocoa powder mixed in with the sticky stuff that makes granola so addictively clumpy AND there are chunks of chocolate that partially melt and sort of float, free-form, throughout this glorious mixture. 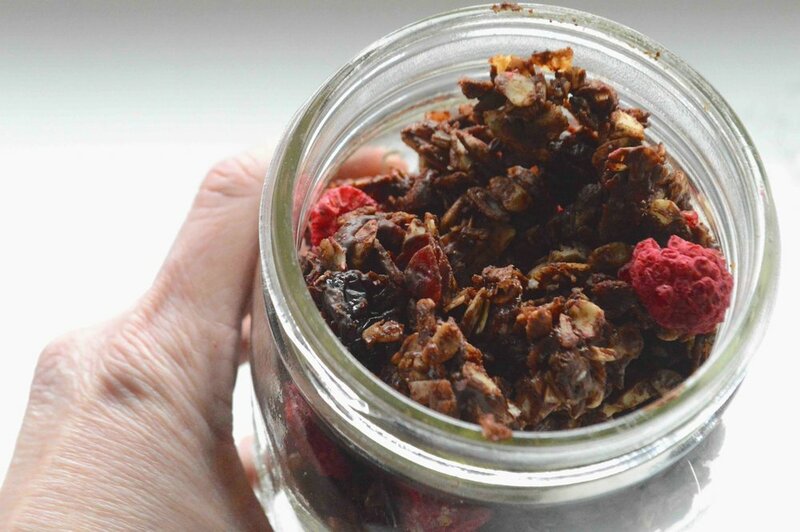 And let’s talk about what else is in here too— in addition to the oats, there are sunflower seeds, almonds and dried cranberries and cherries. So much flavor and crunch. Addictively yummy! I even threw in a bag of dehydrated raspberries to make it a little more valentine-y. Kinda pretty, right? And I love the way the tartness of the berries balances out the sweetness. If you whip it up today, you could serve it atop a little ramekin of yogurt for an extra-special (and very low effort) Valentine’s Day breakfast. Or you could just hand me the jar and let me start nibbling. There’s no wrong way to enjoy this. Makes a nice generous amount although I can’t promise how long it will last—this concoction is addictive!! 1. Preheat oven to 325 F. Spray a large rimmed sheet pan with nonstick cooking spray and set aside. In a very large bowl, combine the oats, sunflower seeds and coconut. Set aside. 2. In a medium saucepan, mix the brown sugar, cocoa, honey, oil and salt together and heat over medium heat until simmering, stirring often. Off the heat, stir in the vanilla. Then quickly pour the mixture over the oat mixture and toss well to get everything coated. Spread the mixture out evenly onto the prepared pan and bake for 15 minutes. Stir, turn the pan once and bake for another 15 minutes. Remove and let cool 5 minutes. 3. 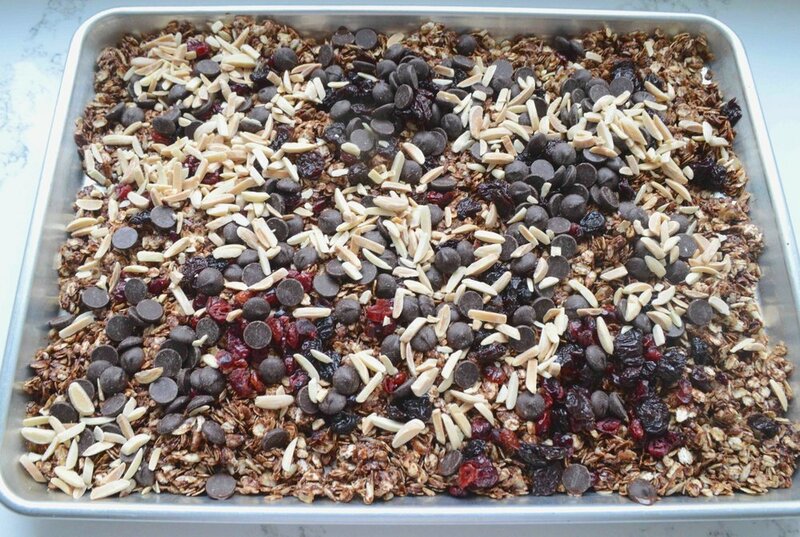 Add the almonds, chips, cherries and cranberries and stir to allow the chocolate to melt all over the granola. Then let stand another 5 minutes and stir again, adding the dried raspberries in the process. Chill the pan for at least 30 minutes to let everything set up. Then break apart clumps and store in airtight containers at room temperature. I’m told this lasts 2 weeks but I believe that that is just a rumor. Note: Recipe loosely adapted from Real Simple. I tinkered a lot and subbed in an out ingredients.